Nicolas Maduro, shaking hands with President Erdoğan ahead of the presidential oath-taking ceromony, July 9. 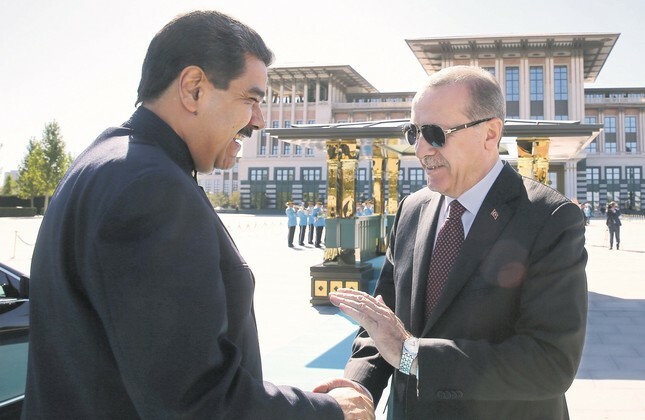 The president of Venezuela, Nicolas Maduro, was one of the special guests at President Recep Tayyip Erdoğan's presidential oath-taking ceremony last week. During his two day trip, Maduro hailed ongoing relations and also praised Turkey' democracy and the whole nation's strong resistance against coup plotters on the night of July 15, 2016. In an exclusive interview with Daily Sabah, the Venezuelan president said that he is very well aware of Turkish history and called President Erdoğan's oath ceremony extraordinary. "Everyone should be proud of Turkish history," he said. During his trip, Maduro also met many Turkish businesspeople and called them to expand the ties for the sake of development and mutual benefits between two countries. Along with his official program, Maduro shared a series of tweets on relations with Turkey, complete with a video of Erdogan's inauguration on Monday with a well-known 1970s song of from the Turkish movie, "Selvi Boylum Al Yazmalim," playing in the background. "Today, Turkey and Venezuela embark on the path to prosperity and development. We cannot miss this opportunity," Maduro said in his tweet. "We have all the conditions to march together toward the happiness and well-being of our peoples. Long live the relations between Turkey and Venezuela!" he said in another tweet. Maduro stated that he wants to realize the dream of a better world, where people live happily, with Turkey while pointing out its advantageous geographical location for global trade. Maduro also visited the set of his favorite television series "Resurrection: Ertuğrul," and invited the directors and scriptwriters to conduct a joint project in his country. As a self-described super fan of the show, Maduro said that the series is very sensitive to humanitarian values. Highlighting that the main character in the series, Ertuğrul, never backs down when confronted with difficulties, he added that he and his country is similar to him in that way. In an interview, Maduro answered Daily Sabah's questions regarding the July 15 coup attempt and talked of mutually beneficial relations between Turkey and Venezuela. DAILY SABAH: First of all, welcome to Turkey, we are extremely happy to have you here. Can you share with us how you feel about being here today? PRESIDENT NICOLAS MADURO: Hola. We're building very close relations with Turkey, we admire your history and your culture. Together we've been able to devise a map of a cooperation that will be mutually beneficial. Venezuela wants peace, development and mutual benefit. DS: July 15, the anniversary of the failed coup attempt is here, so what do you feel? We know that you are very outspoken about this issue. What do you think about what happened in Turkey two years ago? NM: President Erdoğan has been the victim of a coup d'état, which was very similar to coup d'états we've gone through in Latin America. In the same manner that we have denounced and we have defeated coup attempts in Latin America. The first day after the attempt, we expressed our total solidarity with President Erdoğan. There should never ever be a new attempt to trouble the life of the people because we believe that the people say the last word in democratic societies. So we need to reiterate that we need to have a free, independent and peaceful path for the people for them to be able to progress. DS: How about Turkey-Venezuela bilateral relations? Which particular areas need to be improved between the two countries in the near future? We may progress in the production economy in oil and various fields. We are open to development. We have already started in the commercial field, because Turkey is a first rate supplier of raw materials that Venezuela needs. The other fields are refining and processing gold. Venezuela has certified reserves. Currently Venezuela has certified what could become the first largest gold reserve in the world. Likewise, the same goes for the supply of oil and anything related to energy as well as in air transportation and tourism. We are already working in many other areas that are moving forward and they are doing great. Turkey also can benefit from petro cryptocurrency launched by Venezuela. Petro cryptocurrency can be used in foreign trade and investments. This will benefit Turkey and improve our economic ties. DS: Beyond political and economic ties, you are really engaged with Turkish culture. Where does your special interest in Turkish culture and, in fact, popular culture, comes from? I am very much aware of the history of Turkey. It is a wonderful history. Today, President Erdoğan somehow summarized the history of Turkey during the inauguration ceremony. Each person should be very proud of Turkish history. There should be a very wide dialogue of civilizations and different cultures that we can meet with each other in diversity. DS: Turkish people, especially on social media, follow you very closely. You share many things about popular Turkish culture, especially about the well-acclaimed historical TV series, "Resurrection: Ertuğrul." Ertuğrul! My wife and I, we love this historic series regarding Turkey. We never miss an episode of Ertuğrul. Never. DS: Why do you prefer to watch Diriliş instead of watching let's say "Vikings?" I mean why do you prefer to Turkish historical figures and heroes over others? You're right I do prefer them over others. Because in that series, there are many values that are conveyed. Also, the series has a spectacular quality of production and the actors and actresses are perfect in their roles. DS: Gracias, thank you so much. Thanks for your time.